An invaluable guide to help teachers and parents work effectively and successfully with even the most-challenging students. 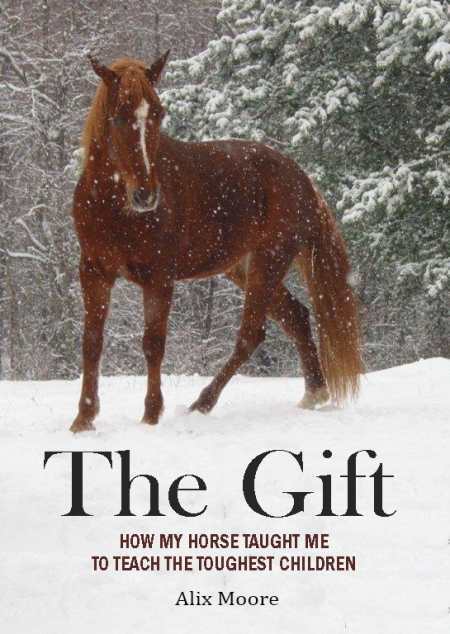 The Gift: How My Horse Taught Me to Teach the Toughest Children is a little gem of an instructional manual that should be required reading for all teachers, whether they are newly minted or seasoned veterans. Using illustrative vignettes from her work training horses and dogs and from working with “unteachable” children, master educator and motivational speaker Alix Moore outlines her philosophy of teaching and provides concrete tips for working with challenging children in the classroom. The book is based on a simple but powerful premise: “With believing eyes, an intuitive heart, and utter patience, we can help all our students, without exception.” Moore offers ten philosophical “gifts” to help teachers become more effective in the classroom, including recognizing when learning jams occur; seeing the moment when learning stops; discovering the real problem beneath the presenting problem; recognizing what success looks like for a given child; and breaking learning tasks into tiny, manageable pieces. Throughout, Moore’s approach is guided by love and patience. “[T]here are two ways I know of to react to learning jams: One is with anger, and that always makes the problem worse; the second way is to step back and find a neutral space that lets you take a look at the problem and begin to see how to fix it.” She cautions that whereas an average student might have a learning meltdown and get over it quickly, fragile learners are less resilient. These challenged students need to experience a series of tiny successes in learning instead of being confronted over and over with tasks they are not prepared to handle. The Gift, Moore’s second book, is professionally produced, free of typographical errors, and concludes with a list of references and suggested readings. The cover photograph of a skittish horse in a snowstorm is eye-catching and foreshadows the book’s theme of the importance of teachers recognizing signs that a learner, whether animal or human, may not be ready to grasp that day’s lesson plan. This is an excellent book for multiple audiences. Novice teachers could learn a great deal about working with children by keeping a copy of it within easy reach. Experienced teachers could benefit from the gentle refresher course Moore provides on working successfully with students who approach learning reluctantly—or not at all. University professors could use the book as a text for classes on teaching methods. Parents, too, could learn effective strategies for interacting with their children during the “teachable moments” of everyday life.